The Day of the Dead is a South American celebration on the days after October 31st. The celebration centers around the return of children who have passed on to their families for one day and then on Nov. 2 dead adult family members get to return to earth to party with their friends and family. Sugar Skulls are created especially for this holiday and are almost always made of pure sugar and candy. Pretty neat holiday, huh? Sugar Skulls are becoming a very popular art form here in the United States as well. Tattoo studios often specialize in the colorful and intricate designs of these skulls. 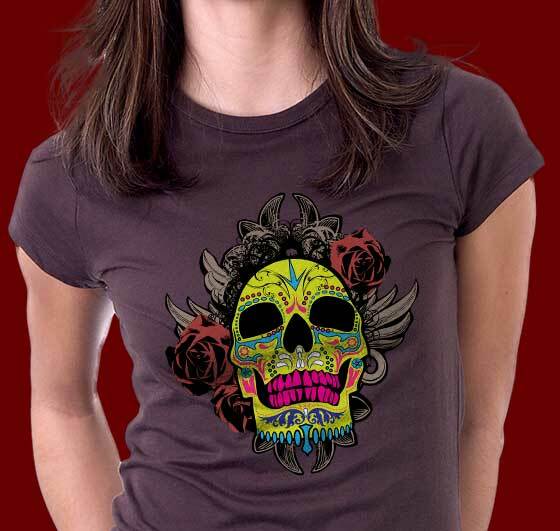 The Sugar Skull tee shirts are available in lots of styles as you can see below. There's something for the entire family and a few cool collectible or gift items at the bottom of the page as well.